Considered a whole grain, quinoa is actually a protein-rich seed native to South America. This trendy grain is a great source of fiber as well as magnesium, which may enhance heart health and improve blood sugar control. Add broth to a medium saucepan and bring to a boil over high heat. Stir in the quinoa, reduce heat to low, cover the pan, and simmer for 12 to 15 minutes, or until all the broth has been absorbed. Remove pan from the heat, fluff the quinoa with a fork, cover to keep warm and set aside. Heat a large skillet liberally coated with oil spray over medium heat. Add the onions and sauté for approximately 15 minutes, stirring occasionally (reapply oil spray if the onions start to stick). Add the mushrooms and sauté for 5 minutes. Season with the salt and pepper. 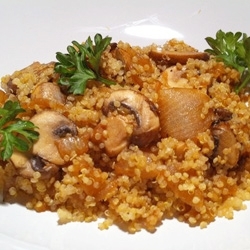 Add the quinoa to the onion-mushroom mixture and stir to combine. Garnish with parsley (if using).